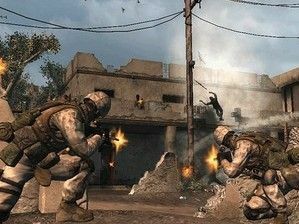 Japanese videogame giant Konami has controversially announced a new game based on the recent conflict in Iraq called Six Days In Fallujah. Six Days In Fallujah is being developed by Atomic Games in collaboration with "three dozen" of the soldiers present at the infamous battle in the Iraqi city. The game is apparently based on those soldier's personal accounts of the battle, along with videos from the frontline. "For us, the challenge was how do you present the horrors of war in a game that is also entertaining, but also gives people insight into a historical situation in a way that only a videogame can provide? "For us, games are not just toys. If you look at how music, television and films have made sense of the complex issues of their times, it makes sense to do that with videogames," adds Mr. Tamte. Tamte clearly thinks that he and his team can "give people that insight, of what it's like to be a Marine during that event, what it's like to be a civilian in the city and what it's like to be an insurgent." Konami vice president Anthony Crouts told the Wall Street Journal that his company was "not trying to make social commentary." Crouts continued: "We're not pro-war. We're not trying to make people feel uncomfortable. We just want to bring a compelling entertainment experience…At the end of the day, it's just a game." But is it really 'just a game'? "The massacre carried out by American and British forces in Fallujah in 2004 is amongst the worst of the war crimes carried out in an illegal and immoral war," Stop The War Coalition spokesperson Tansy E Hoskins told TechRadar, upon reading the first reports of Six Days In Fallujah. "It is estimated that up to 1,000 civilians died in the bombardment and house to house raids carried out by invading troops. So many people were killed in Fallujah that the town's football stadium had to be turned into a cemetery to cope with all the dead bodies. "The American led assault on Fallujah pretended there were no civilians left in the city. Although 60,000 refugees were able to flee, over 50,000 people remained in their homes and took the brunt of the violence and chemical weapons. Months of aerial bombardments, the use of thermobaric weapons and the probable use of white phosphorus turned Fallujah into fields of rubble," she added. "There is nothing to celebrate in the death of people resisting an unjust and bloody occupation. To make a game out of a war crime and to capitalise on the death and injury of thousands is sick. There will never be a time when it is appropriate for people to 'play' at committing atrocities. The massacre in Fallujah should be remembered with shame and horror not glamorised and glossed over for entertainment." Ethical questions over whether or not recent theatres of wars are acceptable fodder for interactive entertainment aside, there are also reports that Atomic Games is planning on using material from the game to create a military training simulation. Eddie Garcia, a Marine sergeant from the Bronx, provided a detailed diary of his experiences which heavily fed into the development of the game. "It's easy to be an armchair quarterback [about war] when you're at home," Garcia told the Wall Street Journal. "There were 19-year-olds in the Marines making life-altering changes. I think this game will add some humanity to the subject." And while gamers and the games industry will no doubt cite the recent outings in Activision's Call of Duty and EA's Medal of Honor series in defence of Konami's latest war 'game-amentary' (the developers term), there is no doubt that this is going to generate a storm of controversy the second Konami announce plans for the release in the UK.